Economical to build yet quite luxurious, the Jazz features design elements and amenities sure to win the approval of people seeking simple, affordable comfort. Thoughtful provisions for daily living and spaces that please the eye contribute to this plan's qualities. 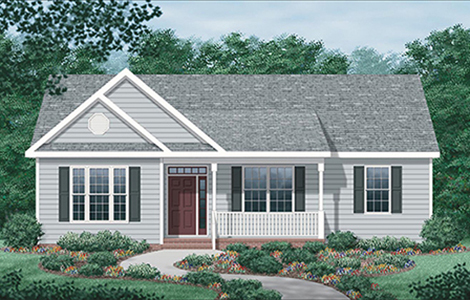 Here are some highlights: Sheltered front entry with an elegant sidelight and transom window. Family room admits plenty of natural light and features a vaulted ceiling A large bay adds to the kitchen/dining room's atmosphere, and a French door provides access to the back deck. Near the kitchen lies a very functional utility room with cabinets and storage shelves. The luxurious master suite has a triple window, a tray ceiling, a walk-in closet, and a private bathroom with a double vanity, garden tub, and separate shower. 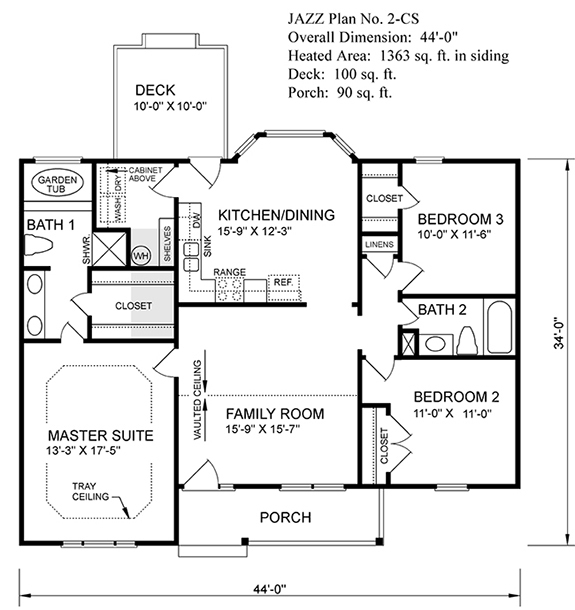 Bedrooms 2 and 3 are situated away from the master suite for added privacy, and they share access to the second full bath and linen closet In addition to its vaulted and tray ceilings, this plan boasts a ceiling height of nine feet in all its other rooms.